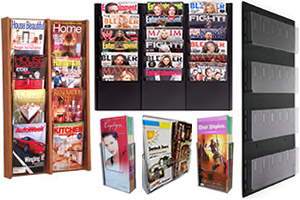 Cheap Literature Holders - Brochure Holders To Magazine Displays! Literature holders, also called brochure displays and magazine displays, are readily available in a large variety of styles and sizes. Magazine displays and brochure display styles accommodate various sizes of brochures, leaflets, pamphlets, publications and magazines. Our product lines include literature displays or literature holders for counter tops, desktops, as well as wall mounted, floor standing and rotating models. Organizing your brochures, leaflets and pamphlets neatly in literature displays in your lobby or waiting room will project a professional company image to your clients while at the same time bolstering your brand recognition. At trade show events, conventions and company expos, displaying your brochures, catalogs and pamphlets in a compatible literature holder is a true necessity for handing out take-one literature. Choose from our cheap cardboard literature displays to our plastic, acrylic, metal wire and wood magazine displays. Display Literature on Counter tops, Floors, Walls Or Outdoors. 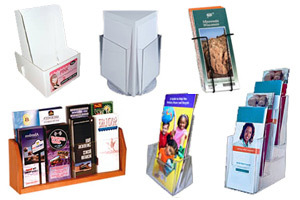 Tabletop or countertop leaflet holders and pamphlet displays are popular for businesses such as retail stores, car washes, trade shows, restaurants, hotels, and doctor's offices that often have high volume traffic areas with lots of walk-in customers. Floor standing literature holders are commonly found in libraries, schools and learning centers and are utilized as racks for displaying books, publications as well as periodicals. Our floor standing literature displays are produced primarily from oak wood. Wall mounted brochure holders, literature displays, booklet holders, leaflet racks or pamphlet holders are widely used by doctor's offices, schools, churches, hospitals and law offices. We offer a large selection of wall rack displays in acrylic, plastic and oak wood. Outdoor brochure boxes and flyer boxes are commonly utilized in the real estate industry and gas stations at the pumps. Increase Your Sales By Organizing Your Literature In Our Cheap Literature Displays! 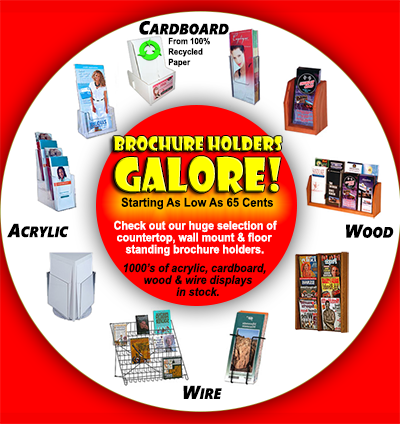 Brochure holders and other literature holders will help increase your sales by displaying your ad with a clear view. Our eye-catching and affordable literature displays are designed to fit all standard literature sizes. Expand your brand recognition simply by keeping booklets, brochures, flyers, leaflets, magazines, newspapers, catalogs, maps, travel guides, pamphlets, tri-folds, bi-folds, and full 8 1/2 x 11 sheets and much more neatly displayed in an orderly manner. Display the single pocket or tiered brochure holders or literature holders near a marketing presentation board display so potential customers can conveniently bring a take-one brochure away with them. 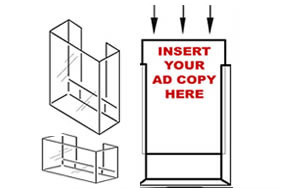 You can also buy bi-fold and tri-fold brochure holders and literature holders, high back brochure or magazine displays, and brochure pockets, also called add-on pockets, to attach to other literature displays, cardboard boxes, easel displays, cardboard stands or printed displays. 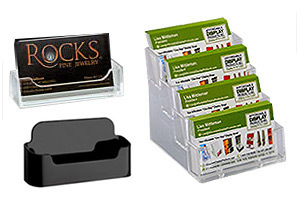 Cheap brochure displays and holders can be used for thousands of your business display needs. We have a huge inventory of various sizes to display your literature, whatever it is. 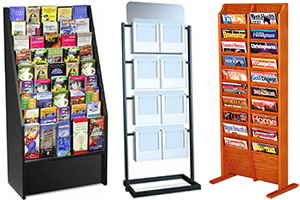 Get your literature displays at low prices today! Affordable Display Products, Inc. is a leading manufacturer and distributor of literature and brochure displays in the USA. Affordable Display Products, Inc. uses the expertise of top die makers, die cutters and paperboard and corrugated suppliers. We not only provide a giant supermarket of brochure racks, cheap literature displays and brochure stands, but we also manufacture other types of packaging, such as cd packaging, dvd packaging, ballot boxes, easel displays, cardboard stands, countertop displays and easel backs.